Bitgo.com is a website that offers security solutions for companies and retail clients that want to use blockchain technologies. It offers crypto currency wallets, offline vaults, private blockchains and API solutions. BitGo managed to gain its reputation due to obsessive bias towards ensuring a high level of security. This aspect is what lead to a high volume of clients and a monthly volume of 1 billion US dollars. 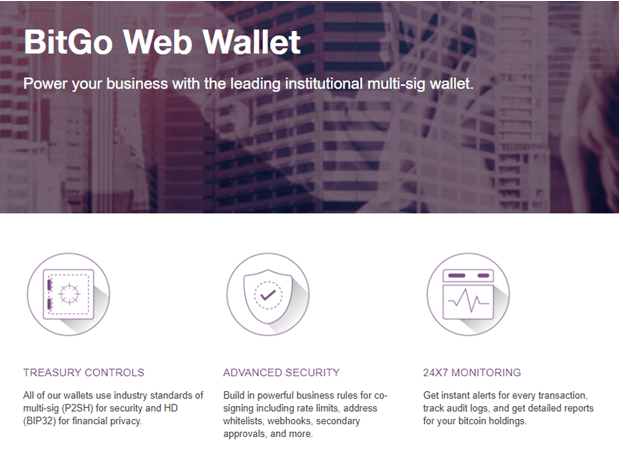 BitGo offers an institutional multi-sig wallet, packed with features and aimed at providing the highest level of security in the market. The BitGo wallets have one of the most advanced security that includes rate limits, webhooks, secondary approvals and many other, together with a 24 hours a day, 7 days a week account monitoring. You will also get notified instantly after you’ve made a transaction and you’ll get detailed reports for your holdings. The BitGo wallet was deigned to support just bitcoin, no other crypto currency is supported by the platform at the moment. One of the most important BitGo features which must be mentioned is the BitGo Instant Transaction. This is a service that allows clients to accept zero-confirm transactions. BitGo runs its own security checks and requires multiple security keys for a transaction to be processed. BitGo basically vouch for the transaction until it is confirmed, so its clients don’t have to worry about big time gaps between accepting a payment and receiving it. BitGo has very strict authentication rules, for example, in order to log in to your account via a web browser you need to have the same confirmed IP address all the time. BitGo is a reliable bitcoin wallet due to its focus on multilayer security. Because of that, it has managed to gain its reputation as a reliable blockchain services provider. When it comes to some weak aspects of the platform, BitGo was specifically designed for the bitcoin system, no other crypto currency is currently supported. BitGo is a crypto currency wallet provider that focuses to provide high level of security to its clients. Although the usage of the wallet is frustrating due to strict security rules, you can rest assured that all your funds are in a safe place. Summary: Bitgo.com is a website that offers security solutions for companies and retail clients that want to use blockchain technologies. It offers crypto currency wallets, offline vaults, private blockchains and API solutions. BitGo managed to gain its reputation due to obsessive bias towards ensuring a high level of security. This aspect is what lead to a high volume of clients and a monthly volume of 1 billion US dollars.